The steering gear is the heart of the steering system. When you turn the steering wheel, the steering gear transfers that motion to the vehicle’s wheels, multiplying the effort you put in so that you don’t have to do a lot of work to turn the car. Noise when steering: Grinding or thumping noises can be caused by a faulty steering gear. This is usually the result of worn components with too much room between them. Binding sensation: Worn or damaged components within the steering gear can cause it to bind. When this happens, it will be more difficult to turn the steering wheel. Steering looseness: Worn internal steering gear components can cause the vehicle’s steering to feel loose. Car is drifting or pulling: A worn or damaged steering gear can result in a vehicle that drifts or pulls to one side. Binding within the gear can cause a pull, whereas drifting is often attributed to excessive internal free play. Bad tires can cause similar symptoms, but either way, it’s important to get this issue checked out immediately for your safety. Power steering isn’t working: In many cases, the electric steering gear and EPS computer will be integrated into one assembly. This EPS computer will receive information from other onboard computers and sensors. A problem with the gear or computer can result in the loss of power steering. An internal failure inside a hydraulic steering gear can have the same effect. Warning lights are on: With an electrically assisted steering gear, a computer monitors the gear’s function. If it detects a problem, it will turn on one or more dashboard warning lights. It will also store a diagnostic trouble code that you or your mechanic can reference during diagnosis. You see a fluid leak: A hydraulically assisted steering gear can leak from several locations, such as the end seals, hose O-rings and pinion shaft seal. These leaks can also cause the power steering pump to whine from loss of fluid. If not attended to, a low fluid level can cause extensive damage to the power steering system. The two basic designs in use today are rack-and-pinion (seen in the image at top) and recirculating ball. This type of steering gear is found on almost all current cars and light-duty trucks. At the end of the steering column is a pinion gear — a round gear — meshed with a rack gear, which is a straight piece of metal with gear teeth. When you turn the steering wheel, the pinion gear turns. This causes the rack gear to move side to side. This, in turn, moves the steering linkage, which controls the steering knuckle and wheels. This allows the wheels to turn left or right. Rack-and-pinion steering systems require less turning of the steering wheel from one side to the other and provide the best feedback from the tires and road to the driver. Mostly heavy-duty trucks and vintage cars use a recirculating ball steering gear. This design uses a complex mechanical system involving a worm gear and ball bearings inside a steering box. It multiplies the driver’s steering effort while reducing friction between the gears. Recirculating ball steering may require three to four full turns of the steering wheel to go from lock to lock. This reduces road feel, but helps turn large truck tires carrying heavy loads. Power steering helps the driver turn the steering wheel and the steering gear assembly. 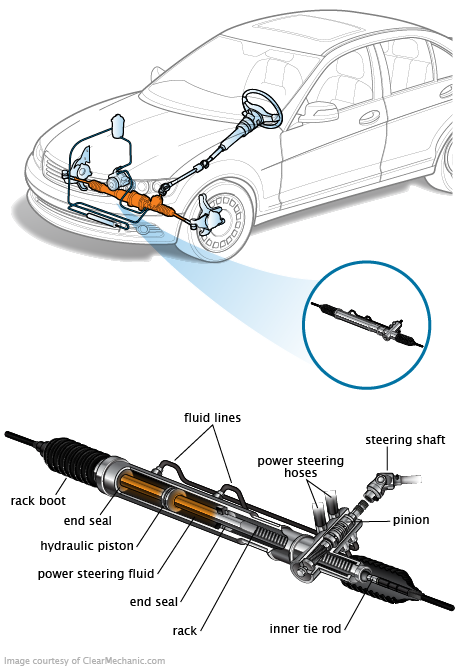 There are two basic types of power steering systems commonly in use: hydraulic and electric. Hydraulic: Hydraulic power steering was installed on most vehicles up until about 10 years ago. This design uses a belt- or gear-driven pump that pressurizes the hydraulic fluid that assists you when you turn the steering wheel. Electric: Most current vehicles have electric power steering (EPS). These systems use a computer-controlled electric motor to provide steering assist. The motor is mounted either under the dash or to the base of the steering gear assembly and is used to move the steering gear left or right based on input from a torque sensor. A bad steering gear should be replaced — if it’s electric power steering, be sure to check its fuse in the fuse box first. If it’s blown, try replacing it. But if it blows again, or if it’s not blown to begin with, you’ll need to replace the gear. This is a big job that’s best left to a professional. It involves removing lines, electrical connectors, steering linkage and more. Certain procedures will need to be done after replacing the steering gear, but doing them incorrectly can result in air bag sensor failure and additional expense. After a hydraulic steering gear is replaced, the system will need to be bled of air and refilled with fluid. An electronic steering gear will often need to have a steering angle relearn performed after installation. Regardless of the gear type, a wheel alignment will need to be performed after gear replacement.